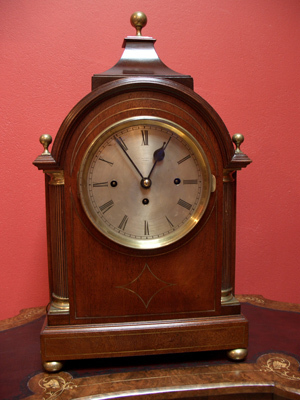 A superb quality English, solid mahogany cased bracket clock dating to c1900. The imposing brass inlaid case, surmounted with inverted bell top has side fret panels, bun feet and five brass ball finials. The substantial five pillar triple chain driven fusee movement, plays Westminster chimes on the quarters on four spiral gongs and strikes the hours on a single spiral gong. The movement with serial number 83195 has anchor recoil escapement and pull repeat. The blued steel hands are original. The rear door has a full glass panel and the front cast brass bezel has the original 6mm beveled glass. The 7” silvered dial is signed J.W. Benson – Paris. This clock also comes with its original key. J. W. Benson was founded in 1847 by James Wilson Benson and Samuel Suckley Benson. It was one of Victorian London’s most prestigious retail jewellers and was maker of its own high quality clock and watch movements. J. W. Benson had their own prestigious premises at 43 Cornhill and 33 Ludgate Hill, London and also a retail premises in Paris from where this clock was sold. Fully restored with one years guarantee.